Have you ever been awe-struck by nature’s engineering prowess and thought to yourself, “how in the world is that possible?” or “wouldn’t it be great if humans could do that?” Did it ever occur to you to think of nature as a big research and development firm with over 3 million consultants and over 3.8 billion years of experience? Welcome to the world of biomimicry – a world where creative and thoughtful people are looking to nature for inspiration. Learning from and then emulating natural forms, processes, and ecosystems to create more sustainable designs. According to Janine Benyus, of the Biomimicry Institute, “…nature has already solved many of the problems we are grappling with; energy, food production, climate control, benign chemistry, transportation, and more.” Designers, engineers, architects and other innovators are asking the question “What would nature do here?” and are finding not just one new idea but myriad time tested, environmentally appropriate, solutions. What better place to explore the idea of biomimicry than the Amazon – nature’s hotbed of innovation and inspiration? 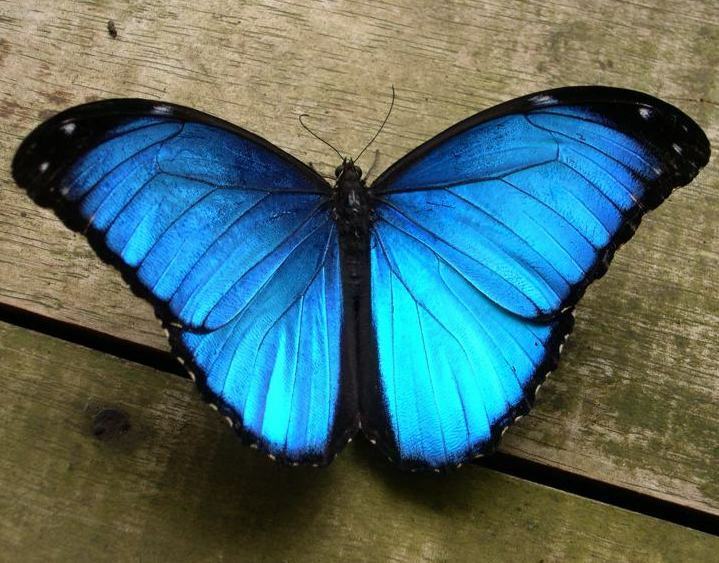 Take for example this lovely blue morpho butterfly. The new “glare-free” e-reader screens were inspired by blue morphos and “mimic” how the wings absorb and reflect different wavelengths of light! Taking a walk down a rainforest trail takes on a whole new meaning if you thinking like a biomimic. Each plant and animal you encounter is uniquely adapted to survive and thrive using a minimal amount of resources, creating a minimal amount of waste, and leaving behind a minimal impact on the environment. Every organism a source of inspiration, a blueprint of design, a model of sustainability. Now imagine using biomimicry as a focus for STEM education – asking your students to study a leaf to learn how to make solar cells or a spider to make resilient fibers. Imagine them learning how to adhere like a gecko, create color like a butterfly, sequester carbon like a mollusk, and air condition like a leaf cutter ant. This summer students and teachers will put on their biomimicry hats and prowl the Amazon rainforest in search of inspiration – learning from nature, not just about nature. ← New species of STEM discovered in the Amazon!